I’m a fan of Gwyneth Paltrow’s blog GOOP, and an even BIGGER fan of smoked salmon-anything, so imagine my delight when I opened this week’s newsletter and found SF’s very own Tartine bread featured in this get-up. Um, I’m making these now. I don’t care if I just ate enough dinner to feed two marathon runners! Here’s the recipe that was featured in her newsletter, adapted from Chad Robertson and his book Tartine Bread. I’m fairly certain this is something I’ll be making again and again. Make the compound butter: in a small bowl, mix the butter, tarragon, thyme, chervil, and salt. 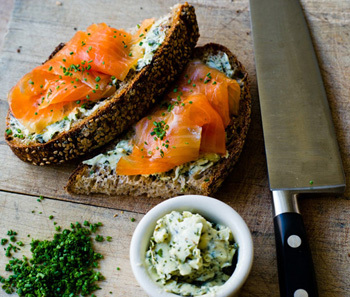 Spread on the bread, top with salmon, sprinkle the chives over the salmon, and top with second slice of bread. Grind white pepper to taste.